Original Title Guaranty building on Walnut Street is at the left. This is where historic papers were found. A demolition project on Walnut Street has unexpectedly turned up documents from Chattanooga's earliest days. Rob Bentley, a young man who has developed a love for Chattanooga's history, said he got a call from his friend Robert Parks about the discovery. His company, T. U. Parks, is doing the demolition and build-out of the former Elks Building at Walnut and Seventh and the small adjacent former Title Guaranty and Trust building. Mr. Bentley, who works at the venerable Chattanooga firm of T.T. Wilson and Company, said, "When they were demoing the old vault the workers found the old documents. Robert went to look at them and a check made out to T.T. Wilson was on top of the pile so he called me to let me know what he had found. "I asked him if they would stop the demo of the vaults so i could come take a look at the papers. By the time I got to the job site some of the documents had already been thrown into the dumpster and destroyed. "I loaded up all the documents I could save out of the dumpster and the ones not yet thrown away into my truck. I went home and organized them the best I could." The cache included many other checks to pioneer Chattanooga businesses. Some of the documents date to before the Civil War. The retrieved items included a book of old documents related to the Samuel Williams family, who were among the earliest Chattanooga settlers. Their home place was near the present Baylor School. Mr. Bentley later met with Sam Hall, who has been saving thousands of old Chattanooga photos and documents through his Deepzoom Chattanooga website. Mr. Hall was excited about the find and has begun scanning the documents. He plans to make all available for public view, including the interesting Williams papers. 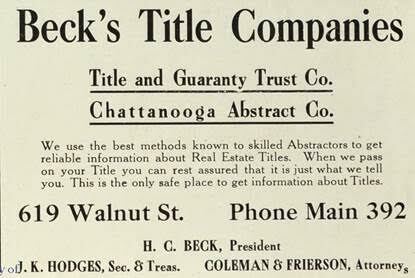 Some of the documents bear the signature of H.C. Beck, one of the founders of Title Guaranty and Trust. The title company later built a much-larger headquarters next door. Both are directly across from the County Courthouse. Through the years, the upstairs portion of the initial Title Guaranty building was rented to attorneys, including Lewis Coleman, a protoge of Coca Cola bottling magnate Jack Lupton. It is believed that the papers that were located were from one of the attorneys renting the upstairs office or from the Title Guaranty operation itself. 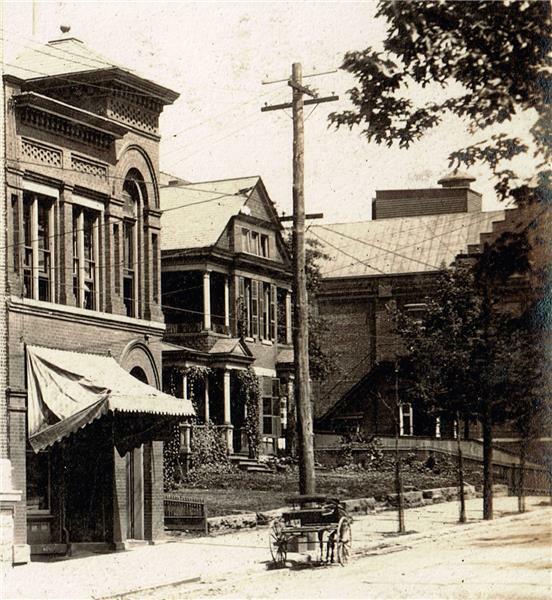 Later the small building was merged with the Elks Building next door. The county named the pair of buildings the Mayfield Annex. The county in recent years vacated the buildings and they are being renovated by Lamp Post Properties, which has been restoring several downtown historic buildings for new uses. Sam Hall said he is always on the lookout for such historic objects that may still be tucked away in attics or basements. He said, "Please don't throw them away as they have a lot of meaning to me and other Chattanooga history lovers. If you do come upon old Chattanooga pictures or documents and have a thought of tossing them, instead contact me at samhall@chattanoogatn.biz or John Wilson at news@chattanoogan.com or 266-2325."